Multilateral development banks (MDBs) are key pistons in the climate finance engine, providing significant international financing for climate adaptation and mitigation and mobilizing private sector capital. Our analysis of the latest snapshot of MDB climate finance for 2016, issued this week, offered cause for celebration – and concern. Climate finance commitments from the six banks totaled $27.4 billion in 2016, compared with $25 billion the previous year, and the second-highest total since the annual reports were launched in 2011. Adaptation finance increased by 24 percent. This is noteworthy, given concerns that adaptation remains underfunded. The biggest increases in adaptation finance came from the Asian Development Bank and the Inter-American Development Bank (IDB). On average, looking at the banks as a whole, climate finance grew by 9.3 percent, faster than the 7.6 percent growth in overall operations. 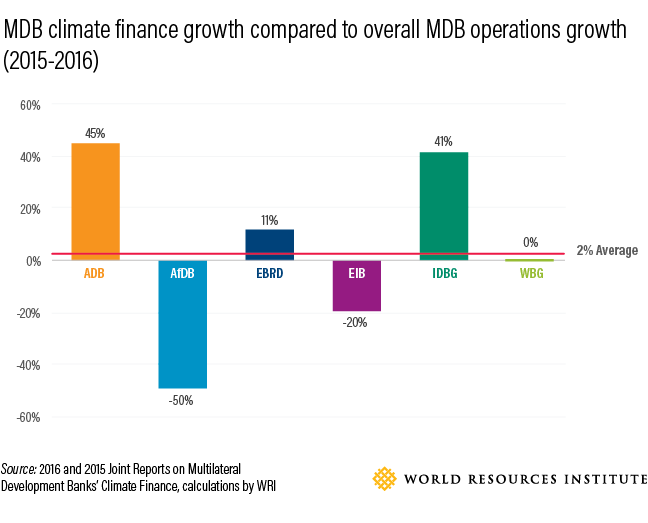 This is good news, because the climate finance targets set by the MDBs are mostly expressed as the share of climate finance in overall operations. If the MDBs are to reach their targets, climate finance must consistently grow faster than their overall portfolios. While climate finance grew faster than all finance on average, the picture was mixed from bank to bank. If this state of affairs persists, some institutions will badly miss their 2020 targets. 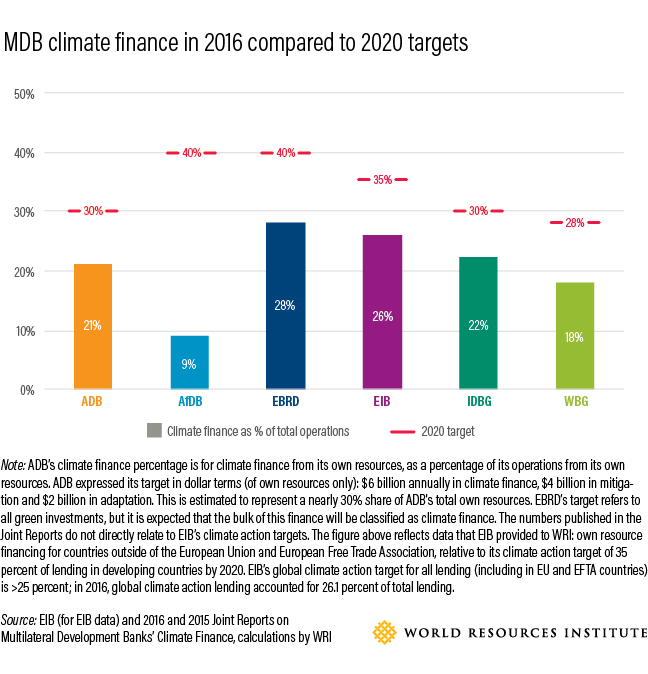 There was a surprisingly large drop – nearly 38 percent – in the climate finance co-financing ratio, a measure of how much capital from other sources, including the private sector, each dollar of MDB financing pulls in. In 2016, on average, each MDB dollar of climate finance mobilized roughly $1.40 in co-finance, versus $2.20 in 2015. The report notes that the level of European Investment Bank co-financing was significantly higher in 2015 than in 2016 due to the cyclical nature of a number of large European Union structural program loans, but that doesn’t explain everything. At first we thought the rest could be related to the increase in adaptation finance, given that adaptation activities typically have lower co-financing ratios. But co-financing ratios did not suffer in one of the two banks responsible for the biggest increases in adaptation financing (IDB). This is worth closer scrutiny. Finally, we note that precious little MDB finance is flowing through equity and guarantees. Only 2 percent of climate finance went out in the form of guarantees and 3 percent as equity. This matters, because guarantees offer the banks a more efficient way to use their balance sheets to support climate projects, while equity offers a more powerful tool to limit transaction risk than lending does. If the banks are to do more with what they have, these equity and guarantee instruments have to be used more actively. What’s not in the report is what needs to be done urgently. The MDBs have become good at reporting how much climate finance they provide. While this is useful, even more important is what they do with the rest of their portfolios; while in 2016 the MDBs provided $27 billion in climate finance, they provided $113 billion for everything else. Bank shareholders and stakeholders need to keep asking to what extent that $113 billion is also promoting the transition to a low-carbon, resilient future, and to what extent the MDBs’ entire portfolios are aligned with scenarios that will keep global temperature rise below 2 degrees C (3.6 degrees F) over pre-industrial levels. We’ve started answering that question for some of the banks already and found that the majority of energy supply projects in our analysis are 2-degree aligned or could be aligned under the right conditions—but that’s a big if. The second urgent matter is ensuring that the MDBs have access to concessional (below market-rate) finance for climate activities. Concessional finance, when blended with the banks’ own market-rate financing, enables the institutions to support transformative transactions. Yet, concessional finance is hard to come by. As we’ve argued elsewhere, there are ways to boost the Clean Technology Fund’s concessional finance for mitigation without requiring new capital. And we strongly urge all MDBs to build strong partnerships with the Green Climate Fund, which will be the largest source of climate-dedicated concessional finance for the foreseeable future. The latest climate finance report suggests MDBs are innovating and working to keep climate finance flowing. But there’s still a long way to go, and the time to 2020 is short. Urgent action is needed to ensure that all the MDBs can meet their targets. Note: the second figure in this blogpost was updated on October 25, 2017 to reflect data that EIB provided directly to WRI.